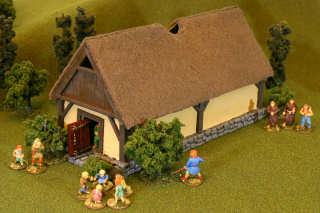 This page describes the construction of a Long House for usewith 28 mm historical miniatures gaming.The Long House was a hub of family and village life in the Dark Agesfor Vikings, Germans, Saxons and many other people of Europe.A large family or several smaller families could cohabitate the Long House.Platform furniture along the walls would serve as beds at night or benchesduring the day.A central fire place in the floor warmed the residents, and the smokewould exit through a hole in the thatched roof.Floor were made of stone, wood planks, or mud.Walls were made from stone, timbers, wattle and daub, or turf.Together the families in the Long House would cook, sleep,tell stories, or play games together. 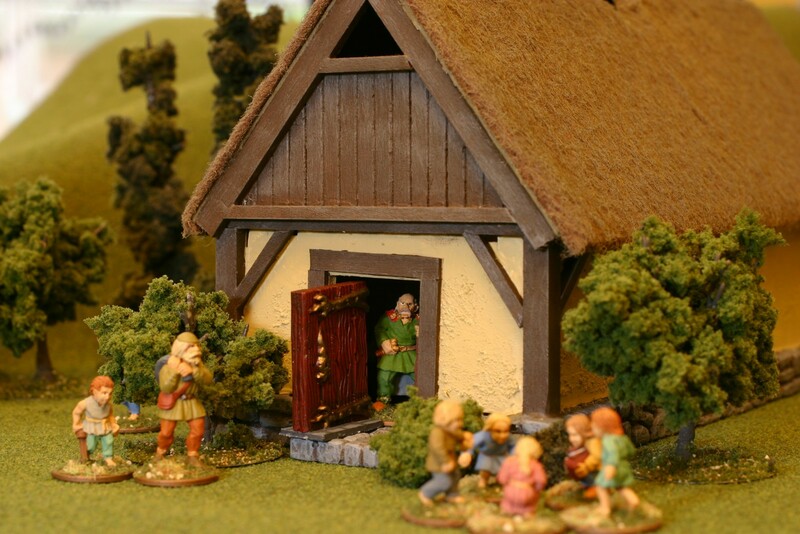 This Long House miniature is made fromHirst Artsplaster cast floor pieces(flagstone floor mold #260 and field stone wall mold #70),bass wood timbers and foam core card,and a thatched roof made from acrylic fur fromthe craft store.Read on to learn the detailed construction techniques. 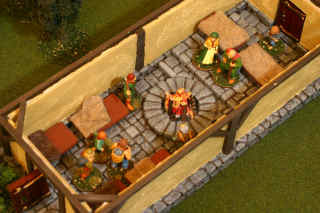 Here is an interior view of the Long House.The floor plan is long with no windows and a doorat each end.There is a round set of stones forming thefireplace hearth in the center.The fire is made from twigs and some tissuepaper painted orange for the fire.One side of the long house has a small raised stepfor important speeches or for the house elders to sleep on.The walls are lined with a total of 6 platform beds,enough for a dozen or more inhabitants. 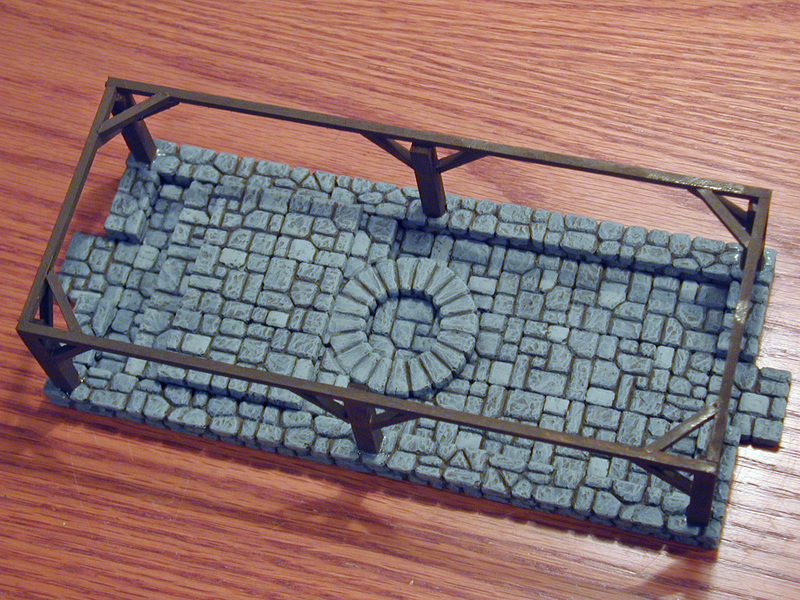 The foundation is made with Hirst Arts field stone bricks.The timbers are basswood, and the wattle-and-daub wallsare made from foam-core paper with some wall plaster for texture.These are all painted with acrylic paints to givea historical color scheme. The first step for this model is to construct the floor plan.Notice an extra tile extends beyond the door to form a door step.The floor is 3 tiles wide by 8 tiles long.Each tile is 1 inch (2.5 cm) square. 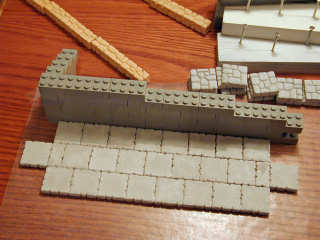 Lego bricks make excellent forms for keeping straight lines.They also form excellent corners for keep walls square and vertical.Another trick is to glue the floor together face down.This keeps the floor level despite having different thickness of tiles.Finally, to keep the tacky glue from sticking to your work area,use a sheet of wax paper.White glue cannot stick to that. 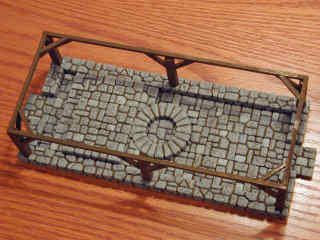 It is easier to paint your foundation before building the rest of the structure.Here I use some dry brushed stones and two shades of gray to give thefloor some variation. 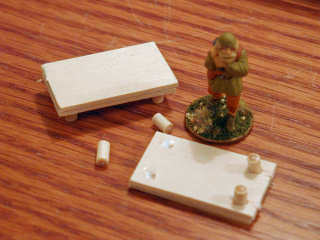 The timbers are basswood and the construction is just like a realLong House.Drill some holes for the supports.Then glue in the supports and place a header beam to the top of the supports.Use lumber that is half as thick as the support beams to help the wallsgo in later.The braces are not necessary for a model of this size, butit helps make the building look more realistic. If you can find painted bass wood or dark colored wood stock such as mahogany(which is common for modellers who build wooden ships), thenyou can save the time of painting the timbers. The roof is constructed with two pieces of picture frame matte, whichis a heavy cardboard with some texture embossed into it.Score and fold the roof.Cut some basswood braces to make the roof hold its shape. Since this Long House will have an interior fire and no chimney,a hole is cut into the roof to let the smoke escape.Similarly, the tops of the end walls have gaps near the apex of the roofto let smoke escape the sides. To timber the end pieces, I cut many pieces of bass wood stock.These were distressed with a knife, lined up and glued to the end pieces.They are somewhat more rustic looking than the prefabricated scored basswoodyou can purchase premade. 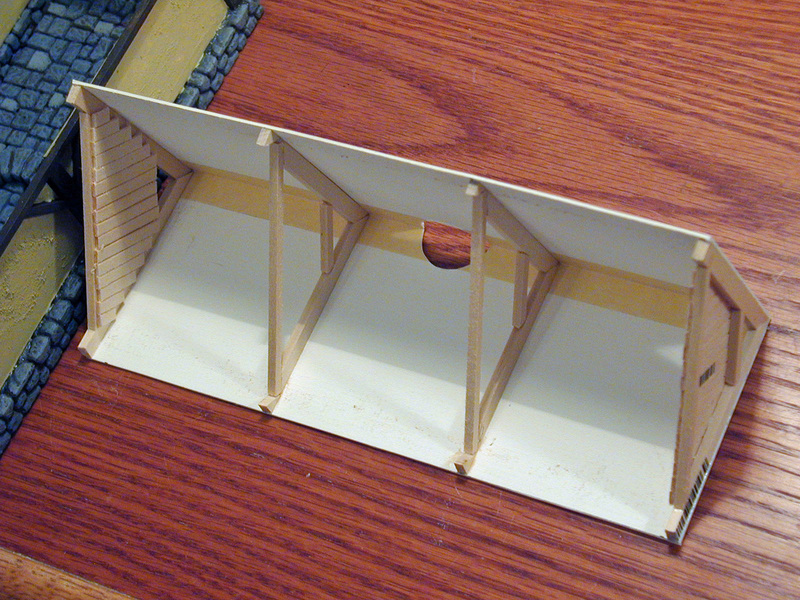 For me the true character of the Long House is made by the platforms liningthe walls.To make these bits of furniture, I took two planks of similarly sizedbass wood.Into one I drilled four holes to accept the tiny dowel legs. (This with extremely precise drill presses can set the hole depth to forma socket in thicker stock).Glue appropriate fur to make a blanket or straw to make someauthentic Dark Age bedding.Don't forget to include the miniature fleas and bed lice! 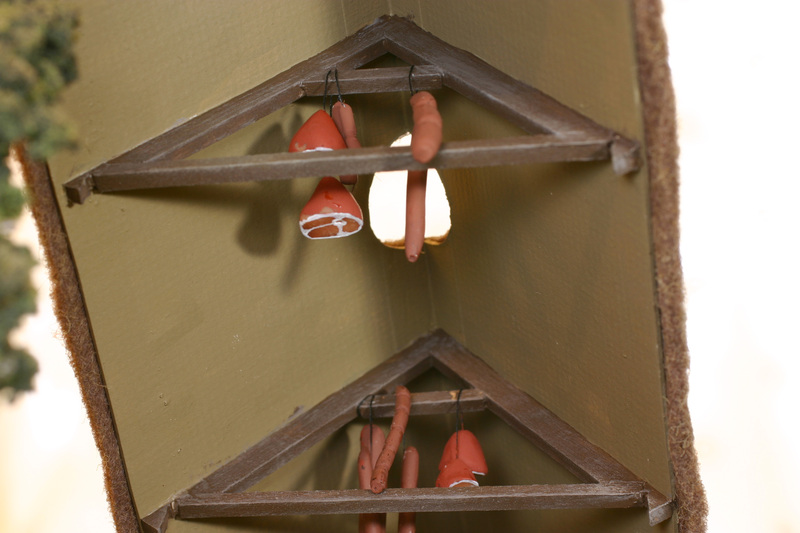 Here I made some ham legs and some sausages fromair dried clay.Paint it brown and hang it up for some good eating. 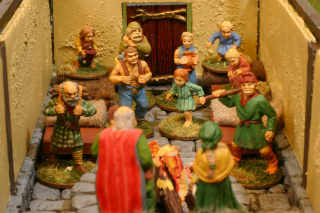 Here we see the front entrance to the Long House.The Village Elder peeks through the doorand calls the family into to an important meeting. Note the thatched roof which is made from brown acrylic furfrom a craft store.It is dry brushed with some yellows and greys to make it lookmore like thatch. The doors are made from two Hirst Arts doors glued back to back.The door is cut down to size and glued to a stand that allowsthe door to be set open, closed, or kicked-in! Here is what a typical evening would look like maybe a thousand years ago.The Elders tell a story as the rest of the clan listens in wonderment.They say to themselves in awe, "Gee, will I ever to be that old. 30 years sure is a long time." Last modified: Sunday, 16-Sep-2018 17:17:37 MST.